NVIDIA's flagship GeForce® GTX 1070 is the most advanced gaming GPU ever created, powered by the new NVIDIA Pascal™ architecture. The GeForce® GTX 1070 comes with ultra-fast FinFET and high-bandwidth GDDR5 technologies, plus support for DirectX 12 features to diliver the fastest, smoothest, most power-efficient gaming experiences. Get the power to drive VR, ultra-high-resolution, and multiple monitors. Plus, bring more realism to every game with NVIDIA GameWorks™ technologies that deliver a true cinematic experience, smoother gameplay, and amazing new image-capture to share your game. All with the lowest latency and plug-and-play compatibility with leading VR headsets. *VR Performance based on Barbarian benchmark. Intel Core i7-5960x, 16GB DDR4 memory, X99 motherboard. 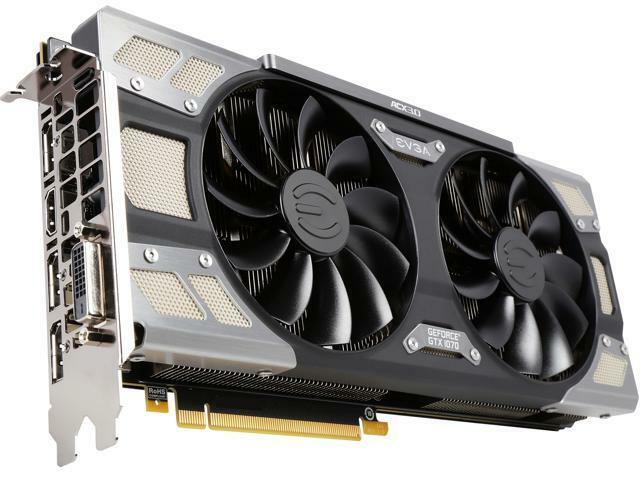 The EVGA GeForce GTX 1070 uses the power of Pascal to meet the demands of the latest displays, including VR, ultra-high-resolution, and multiple monitors. It features NVIDIA GameWorks technologies for smooth gameplay and cinematic experiences, as well as revolutionary 360-degree image capture-even in VR. Discover next-generation VR performance, the lowest latency, and plug-and-play compatibility with leading headsets-driven by NVIDIA VRWorks technologies. VR audio, physics, and haptics let you hear and feel every movement. 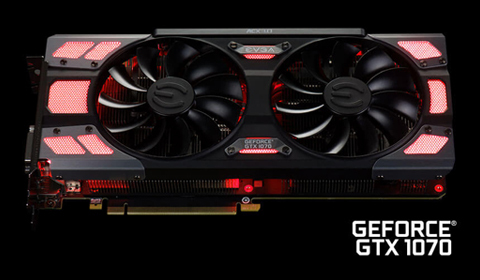 An RGB LED that allows complete control of the color through EVGA PrecisionX OC. - Possibly not as much GDDR memory as other cards in its price range? Other Thoughts: I would highly recommend this card to anyone looking for a capable, mid-range and inexpensive video card, especially for more novice PC builders out there, that can hold up to even the latest games with a decent supporting cast of hardware around it. I have owned this card for 2 years, and still can play the majority of games out there accompanied with a 4.0Ghz CPU and 12GB of memory. For most users this will be enough, but if you're looking to max out every game, the newest of what will come out in 2019 without having a good CPU to push through and make up for the lacking GDDR memory that other cards can offer, then I would recommend buying something STILL Nvidia, not ATI, but up a little higher like the 1080TI if that price is more applicable or even the newer ray-tracing capable cards that will be utilized towards the end of the year. But for me, when I upgraded from a 3.5 overclocked i7 intel processor, I still held onto this card as it is more than capable of handling what games I play, and noting that I also stream and use this one card for both monitors I have, and also the newest games that will be yet to release first quarter of 2019. My rating sits even now still at the 4 out of 5. Thanks! Pros: -Runs everything at Ultra or High such as Deus Ex: Mankind Divided, Witcher 3 and anything else I can throw at it. -Had the most up to date bios and the thermal issues that some people had when it was released as been resolved a long time ago. Cons: - Doesn't bring me coffee? - My computer room is now cold because the video card it replaced was a space heater and this one stays frosty? Other Thoughts: The planets aligned and was able to pick this up for less than 300 USD (and a copy of Monster Hunter World!). Last time I checked, it was almost 600 USD. Its a great buy If you can get it for 300 to 400 USD otherwise I would think twice with the current slugging match between AMD and Nvidia. Pros: Plays everything well. Very nice looking design. Super nice packaging. Cons: None, except it sounds like one of my fans has a bearing going out and it's only a couple months old. I guess I'm going to take the card out and examine it and see if there's anything I can do. Maybe replace, or disconnect. It doesn't run that much, most annoying on startup. Other Thoughts: At the price I got it on black friday, I'd certainly buy again. All in all, the fan is a minor problem, but wasn't expecting from a quality outfit like EVGA. I do apologize for the troubles you are having with your EVGA GTX 1070 graphics card. I can assure you that we are here to assist and support you as best we can. If you haven't already done so, then I would encourage you to contact our 24 hour Technical Support team by phone 1.888.881.3842 and pressing option 1 or by email: Newegg@EVGA.com with your reference# 3304021 so that we can further assist you. Cons: The only problem I have with it is the coil whine. Currently, I'm running on a 144hz g-sync monitor. Pros: Fast and cool as advertised. Cons: Not really a con. Tight fit in a midsize. Do some measuring if you're not sure. Pros: Luckily it Works, and hopefully it stays that way; easy installation. SUPER FAST SHIPPING! Cons: Opened box repackaged then sold as new, missing all accessories that come in the box including those that could be essential to the video cards use. Other Thoughts: TLDR: I received a "new" card that was opened at some point had everything removed; the card was replaced in the box then it was re-shrink wrapped and sold as new. Box was missing all essential items that go with the card ie. drivers disc, misc software disc, swag, hardware adapters, screws etc. Unfortunately I am unable to return the video card to New Egg. My experience started off good. New Egg had a great price and shipped very fast. The card came in a shrink wrap sealed box like every other GPU I have ever purchased. The first thing I thought when I pulled the 2nd box out of the 1st is man this is nice packaging; its very Apple like, but things went from wow this is "Classy" to this is really "Ghetto" when I noticed everything was missing except the card. Nothing in the description said anything about this being a refurb unless EVGA or New Egg is selling refurbs as new. When I say Nothing was in the box except the card. NOTHING WAS IN THE BOX EXCEPT the card. Luckily the card still had all of the plastic protective stickers all over it that you remove prior to use, so I assumed it might be new, but the drivers precision oc disc were not in the box, the user guide, promo stickers 8 pin power adapter wires and everything else that should be in the box was missing. The seal had been not broken on the anti static package but it was lifted; indicating at some point it was removed from the packaging and handled. I am seriously considering returning the card....whoops its not eligible for return, imagine that! When people buy "new" products they expect "new" not "open box" and repackaged or used products.This is the first time I have been disappointed with new egg, and EVGA. If I didn't know how to work around the problems with the cards installation due to so much missing product these guys would have ruined this Xmas for me and my sons gaming rig. 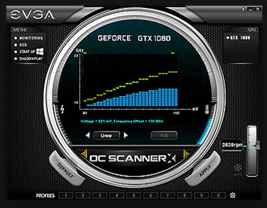 I do apologize for the troubles and confusion you are having with your EVGA GTX 1070 graphics card. I can assure you that we are here to assist and support you as best we can. However with a graphics card of this caliber we do not recommend using Y power adapters and strongly suggest using the power cables directly from the power supply. Hence why these adapters are no included with the graphics card. Driver disc is no longer included as well as Nvidia are constantly updating the drivers and it is Strongly recommended that you download the most current drivers. 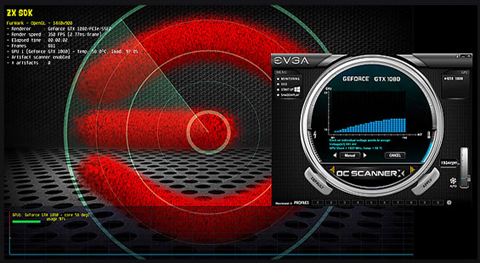 Should anyone have any questions or concerns with any EVGA products, please do not hesitate to contact our 24 hour Technical Support team by phone 1.888.881.3842 and pressing option 1 or by email: Newegg@EVGA.com so that we can further assist you. Pros: Played most games on ultra. Cons: Died several months after the warranty ended. I do apologize for the troubles you are having with your EVGA GTX 1070 graphics card. If purchased as a new retail model the GTX 1070 should carry a standard 3 year warranty. If you are within 3 days from the date of purchase with a valid invoice and haven't already done so, then I would encourage you to contact our 24 hour Technical Support team by phone 1.888.881.3842 and pressing option 1 or by email: Newegg@EVGA.com so that we can further assist you.